Hello again! I hope you guys are having a great week so far! I’ve been having a lot of fun these last couple of days because of The Daily Marker’s 30 Day Coloring Challenge. I have been keeping up with the challenge and been coloring everyday so far. I know we’re barely on day 4 but if you know me…. Anyway, you should really check out The Daily Marker site and look up #TheDailyMarker30Day2 on Instagram and see all the neat coloring going on. For day 3 of the challenge I colored the unicorn from the Spectrum stamp set from Paper Smooches and decided to use it for a card. 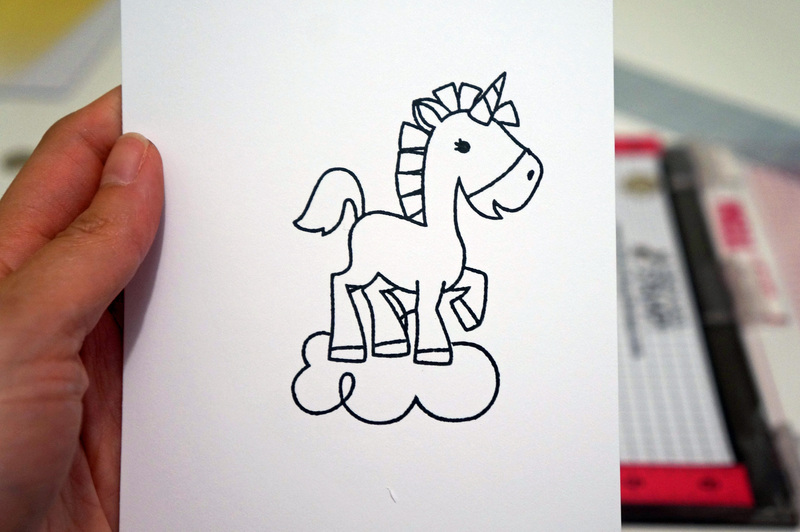 This is my third card using Spectrum and all because of this little unicorn, it’s adorbz! Also, I will be submitting this to the Paper Smooches SPARKS Anything Goes Challenge. 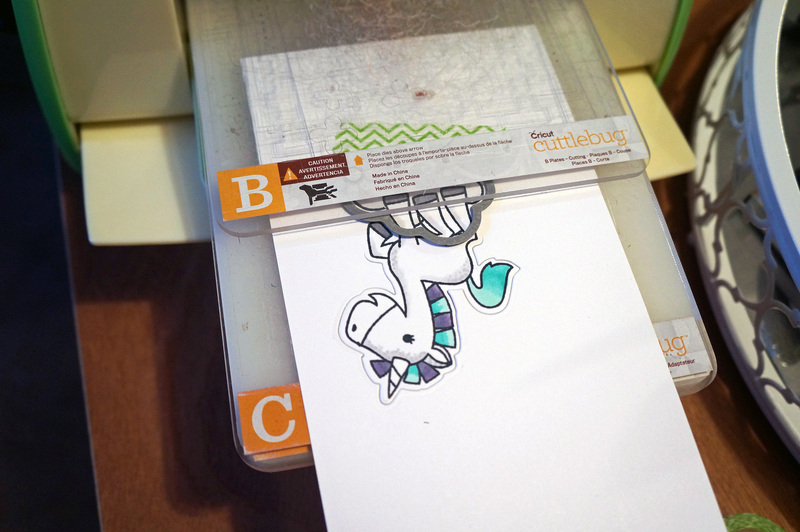 I wanted the unicorn on top of a cloud and so when I do masking, I like to do it with masking tape. I stamp my image on a couple of pieces of tape, depending on how wide the image is. I know this might seem like more work but it’s easier for me to cut each strip and really because I have masking tape and no masking paper. I only cut the bottom portion of the unicorn’s body because I knew the cloud was going to only reach the top of it’s legs. 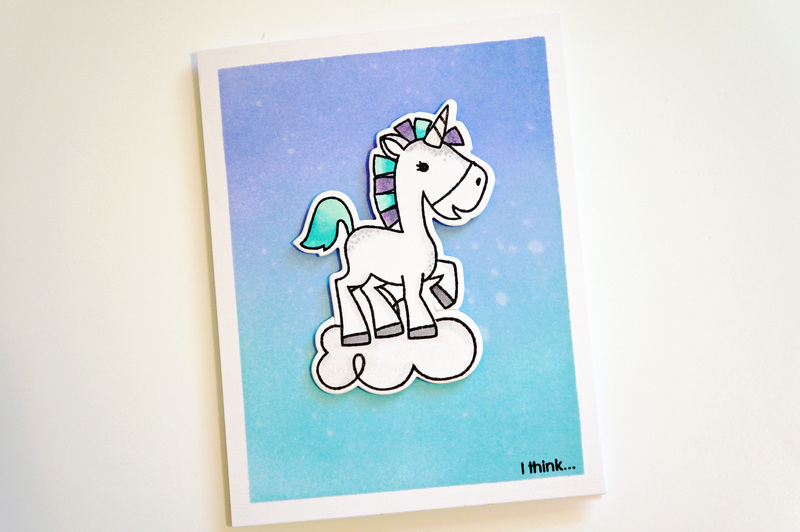 I placed the tape on the stamped unicorn and stamped the cloud on top with my MISTI. I just love how crisp the images look when stamped with the MISTI. I also decided to do partial die cutting. I cut the top of the unicorn after I colored it. Then I turned it around and cut the bottom of the cloud. 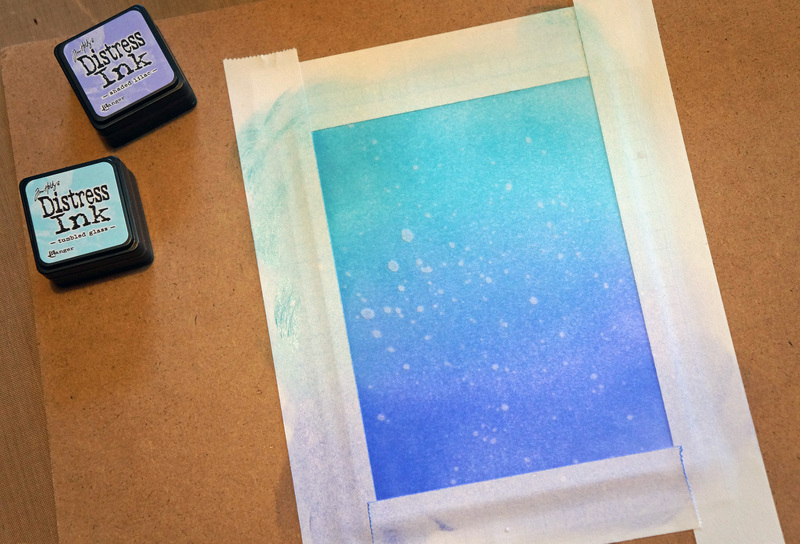 I made an ombre background using Mini Distress Inks and sprinkled a little water on it. Here’s a tip, in order to make sure I masked the edges the same length, I used graph paper underneath. To finish it off, I colored the unicorn horn and cloud with clear Wink of Stella and stamped the rest of the sentiment inside the card. I just can’t get enough of this set! You can check out the two other cards I’ve made with this set here and here. Next Post Uno Mas Por Favor! So many wonderful techniques on one card! I LOVE the masked unicorn, and your gorgeous background! Perfection! 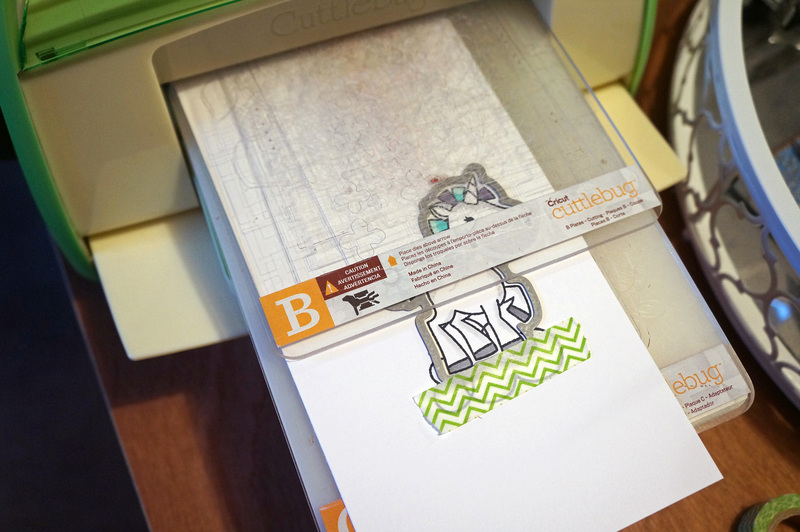 Thanks for joining us this week at Paper Smooches Sparks! Fabulous masking and coloring on the unicorn image! Love the inked background, too. Thanks for joining us at Paper Smooches SPARKS! 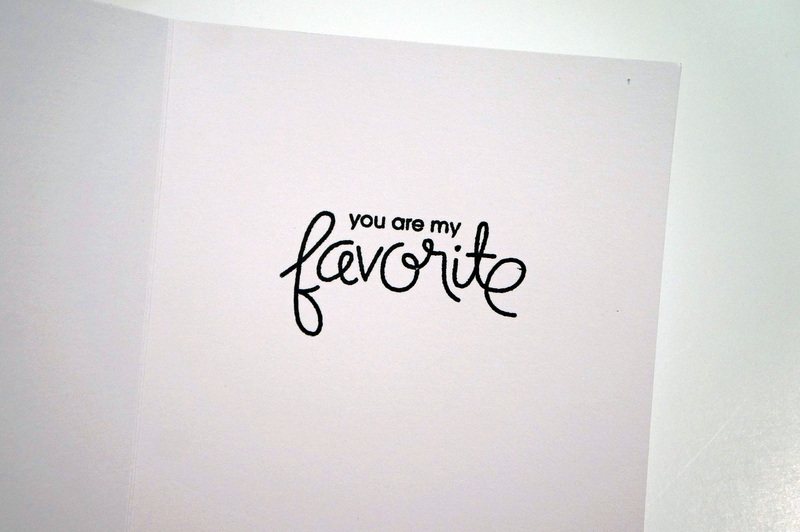 Your card is so cute and adorable.Love your background. It really shows off your unicorn. Thank you so much for participating in The 30 Day Coloring Challenge and I hope you will be up for the next one.